Peanut butter and chocolate has to be one of the most classic, and delicious flavor combinations of all time. I’ve eaten them together in lots of different ways, but one of my very favorite ways to enjoy the combo is with buckeyes! I was introduced to these wonderful treats by a good friend and coworkers who went to Ohio State. Knowing that I loved to bake, she insisted we make them together. When she first described them to me, I thought they sounded good. Peanut butter, powdered sugar, and chocolate…what’s not to like?? It’s basically a sweetened peanut butter ball covered in chocolate!! I also loved how simple and easy they were to make. The buckeyes came together quickly, and were stress free! Since they don’t require baking, it doesn’t matter if the sizes vary a bit. Before I knew it, we’d made the peanut butter centers, and were dipping them into melted chocolate. As I bit into my first buckeye, I was smitten. I figured if I love buckeyes that much on their own, I couldn’t imagine how delicious a buckeye-inspired cake would be. 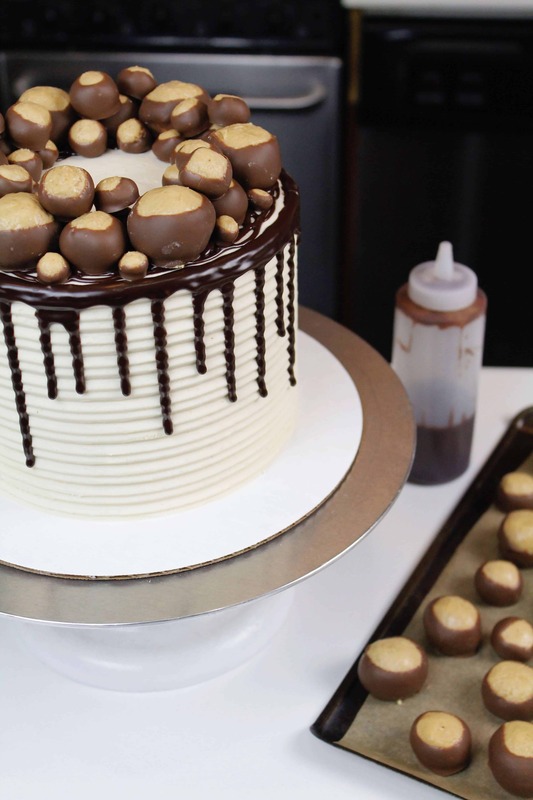 Immediately my imagination went to work…I pictured moist chocolate cake layers, creamy Jif® Peanut Butter frosting, chocolate drizzles, and of course, some buckeyes for decoration!! 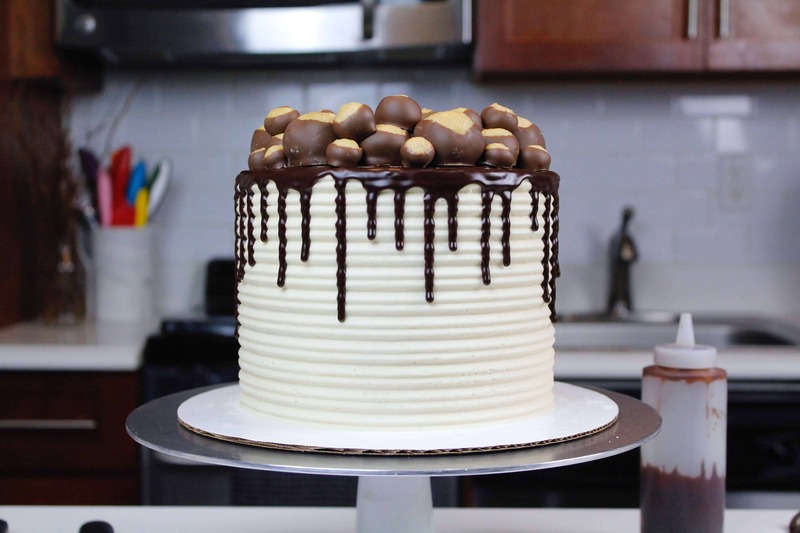 As an added bonus, I made this cake just in time for National Peanut Butter Day!! 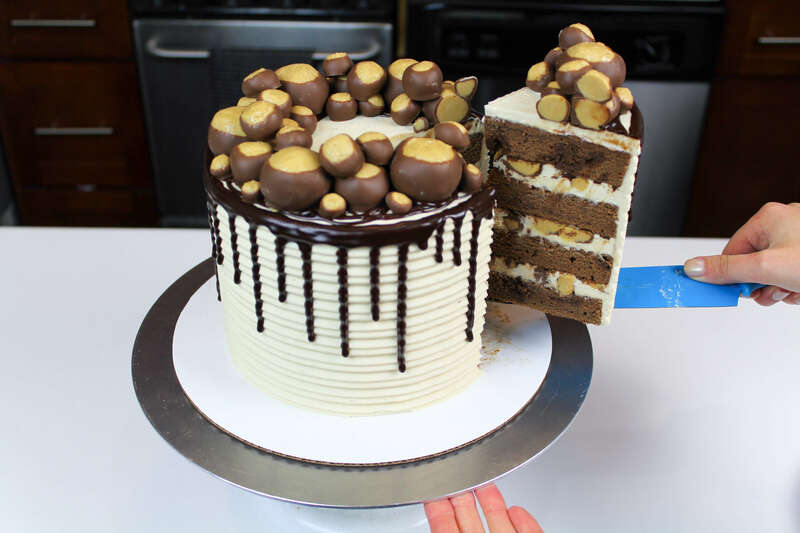 With all the Jif® Peanut Butter in the frosting and buckeyes, this cake is a perfect way to celebrate. The buckeyes can be made several days in advance, and stored in an airtight container in the fridge. I recommend making them ahead of time, to simplify the process, and allow you to enjoy decorating the cake. You can also make the frosting and cake layers in advance!! I hardly every make all the components of a cake the same day I plan to decorate it. I also recommend using Jif® Peanut Butter when making your buckeyes! I grew up eating creamy Jif® Peanut Butter (PB&J sandwiches were my thing as a kid), so it’s always my go to peanut butter when I’m baking! It has such a wonderful fresh-roasted peanut taste. Begin by making the chocolate cake layers. Preheat the oven to 350 degrees Fahrenheit. Line four 7 inch or 8 inch pans with parchment rounds, and spray with non-stick spray. Add the sugar (2.5 cups) and butter (1 cup) into the bowl of a stand mixer, and whisk on high for 1 minute. The mixture should become light in color. Add in the eggs (4), one at a time. Then add baking soda (1 tsp), baking powder (1.5 tsp), and salt (1 tsp). Mix on high for another minute. In a separate bowl, combine hot water (1 cup), and buttermilk (1 cup). Pour in the unsweetened baking cocoa (1 cup), and whisk until no clumps remain. Next, add 1 cup of flour into the butter /egg mixture. Scrape the sides of the bowl with a spatula, to ensure the flour is fully incorporated. Pour in half of the buttermilk / cocoa mixture, and gently pulse the mixture to incorporate the liquid (if you don’t, you’ll end up splattering the cocoa mixture all over your kitchen! Please learn from my mistakes :P). Mix in the 2nd cup of flour, and mix at a medium speed. Pour in the remaining buttermilk / cocoa mixture, and again gently pulse, then mix on low until fully combined. Add in the last cup of flour, and mix on low until the flour is incorporated. Evenly divide between the four prepared pans. I like to use a kitchen scale to ensure each pan has exactly the same amount of batter. Bake according to the size of pan. For 7 inch layers, bake for 35-37 minutes. For 8 inch layers, bake for 32-33 minutes, or until a skewer comes out clean. Place the pans in the freezer for about 45 minutes, to accelerate the cooling process. Once the layers are fully cooled, carefully flip the pans and remove the layers. While the cake layers bake and cool, make the creamy peanut butter frosting. Beat the butter and Jif® Creamy Peanut Butter on a medium speed for 30 seconds with a paddle attachment, until smooth. Once fully mixed, add in the egg whites and salt, and beat on low until the ingredients are fully incorporated, and the desired consistency is reached. The last component of this cake is the chocolate ganache! Heat heavy cream (1/3 cup) in a heat-proof bowl in the microwave for 45 seconds to 1 minute, until gently bubbling. Gently pour chocolate chips (1/2 cup) into the heavy cream, making sure they are fully covered with cream. Allow mixture to sit for 2 minutes. Set aside to cool for about 20 minutes (or place in fridge for about 10 minutes). You can also make this in advance, and store it in the fridge until you’re ready to use it. Heat the ganache in 3 15 second increments, or until it reaches the right viscosity. It should be slightly warmer than room temp, but to hot enough to melt the buttercream on your chilled cake. Next, it’s time to assemble the cake!! Add a dab of frosting onto your or cake plate. 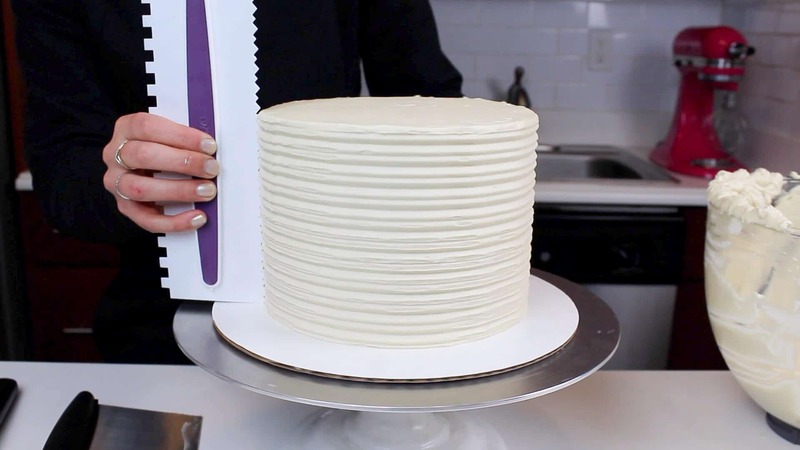 This will help keep your cake layers in place as you frost and stack the layers. 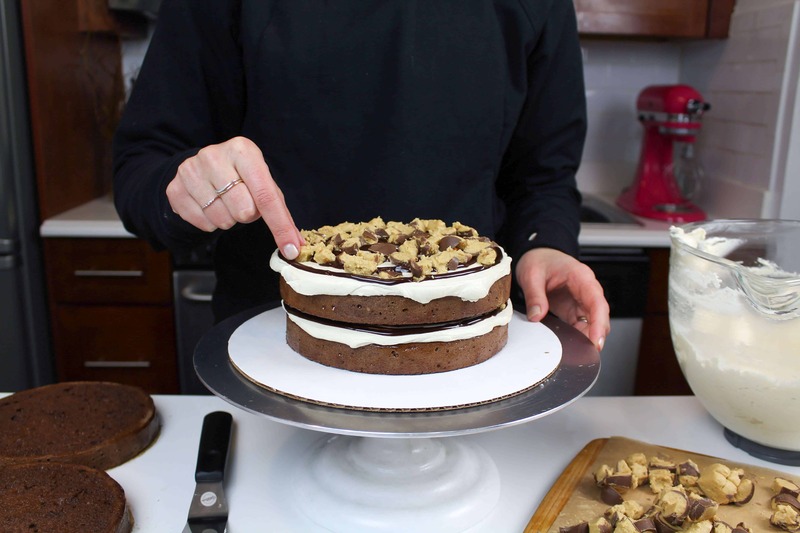 Use a large offset spatula to spread an even layer of peanut butter frosting onto each cake layer. Sprinkle chopped up buckeyes on top of the frosting, and drizzle with chocolate ganache. Repeat this process with the remaining cake layers. Cover the cake in a thin layer of frosting, to trap in any pesky crumbs! Use a bench scraper to smooth the frosting, then pop the cake into the fridge or freezer to allow the crumb coat of frosting to chill and firm up. Once the crumb coat is firm to the touch (takes about 5 minutes in the freezer), cover the cake in a second, thicker layer of red buttercream frosting. You can see an in-depth tutorial on how to get super smooth sides on your cake here. For additional texture, use an icing comb to create lines around the cake. Place the cake into the freezer for about 10 minutes, allow the frosting to chill again. This step is crucial, to ensure that the warm chocolate ganache drips set in the next step. Once the cake is chilled, add the chocolate ganache drips. 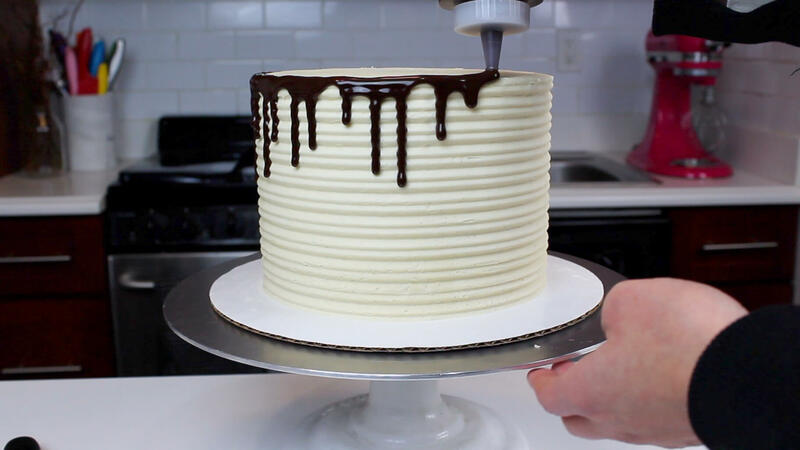 I prefer to use a bottle, since it makes the process so much easier, but I also like the way drips look when they’re added to a cake using the spoon method. The last step is to decorate the top of the cake with the remaining buckeyes! I chose to create a buckeye ring around the top of the cake, but it’d also be fun to make a buckeye pyramid, or to place buckeyes on top of frosting swirls! Begin by preheating the oven to 350 degrees Fahrenheit. Line four 7 inch or 8 inch pans with parchment rounds, and spray with non-stick spray. Pour in half of the buttermilk / cocoa mixture, and gently pulse the mixture to incorporate the liquid. Mix in the 2nd cup of flour, at a medium speed. Pour in the remaining buttermilk / cocoa mixture, and again gently pulse, then mix on low until fully combined. Evenly divide between the four prepared pans. Bake according to the size of pan. For 7 inch layers, bake for 35-37 minutes. For 8 inch layers, bake for 32-33 minutes, or until a skewer comes out clean. Use a serrate knife to level the tops of the layers, and then frost as desired. Beat the butter and Jif® Creamy Peanut Butter on a medium speed for 30 seconds with a paddle attachment, until smooth. If you don’t have a microwave or prefer to use the stove top, you can heat the cream over a medium heat in a pan until it begins to simmer. Remove from heat and pour into a heat-proof bowl. Gently pour chocolate chips into the heavy cream, making sure they are covered with cream. Allow mixture to sit for 2 minutes. Set aside to cool for about 20 minutes (or place in fridge for about 10 minutes). You can also make this in advance, and store it in the fridge until you’re ready to use it. Heat the ganache in 3 15 second increments, or until it reaches the right viscosity. It should be slightly warmer than room temp, but not hot enough to melt the buttercream on your chilled cake. If it seems to thin or thick, you can add a touch more chocolate or heavy cream! The type of cream and chocolate that you use can affect the consistency, so feel free to adjust as needed. 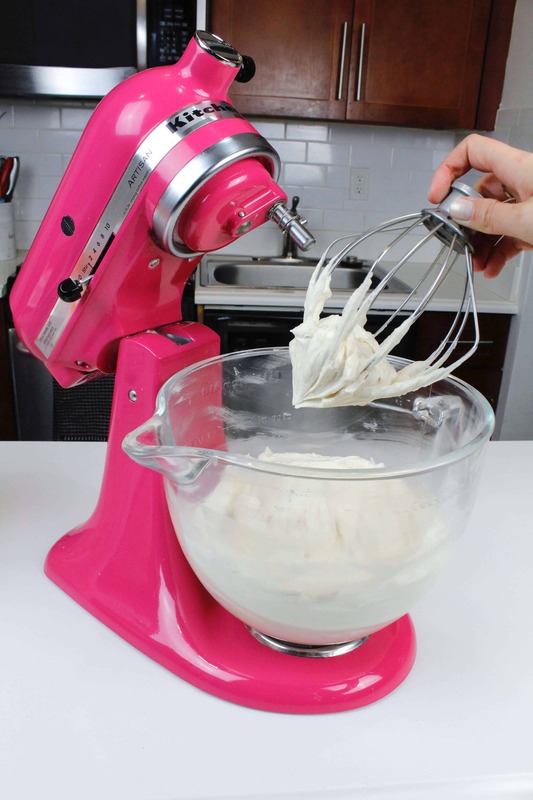 Mix together peanut butter, butter, vanilla and salt using the whisk attachment of a stand mixer (or a hand mixer). Add 2 cups of powdered sugar, and mix on a low speed until fully incorporated. Beat in the remaining 2 cups of powdered sugar. The dough will pull away from the bowl at this point, and become firm to the touch. Shape into balls, ranging from 1/2 inch to 1 1/2 inches, and place in the fridge to allow them to firm up. Place chocolate chips and shortening in microwave-safe bowl. Microwave at a medium heat for 30 seconds. Remove from microwave, and stir. Repeat until chocolate is fully melted. If needed, heat in additional 30 second increments while coating peanut butter balls. Insert toothpicks into the top of each peanut butter ball. 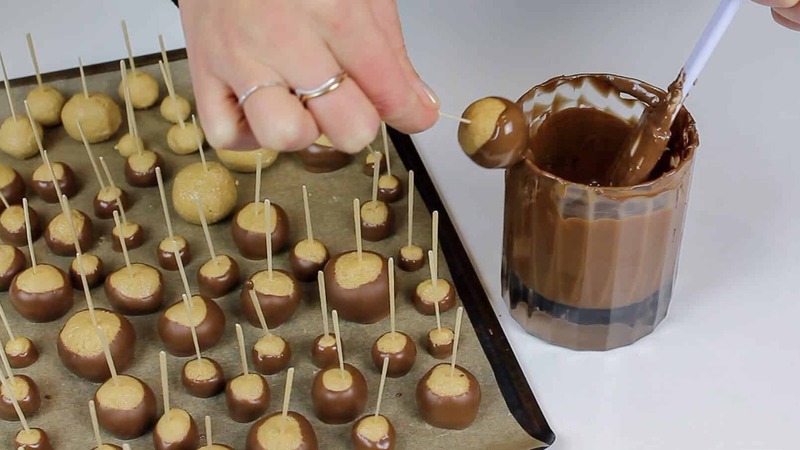 Dip each peanut butter ball into chocolate, covering about 3/4 of it with chocolate (to resemble a buckeye). Allow any excess chocolate to drip off, then place on a tray lined with wax paper. Remove toothpick, and carefully smooth over holes. Refrigerate until firm. When your making your peanut butter frosting, you speak about adding egg whites to the peanut butter, butter and powder sugar mixture. Are the egg whites wiped or cooked over a double boiler prior to adding? I want to give this cake ago this weekend, thank you for all your inspiration and congratulations on your new came business adventures!! I use pasteurized egg whites from a carton, so they’ve already been heat treated! If you don’t have pasteurized egg whites, you can definitely heat them over a double boiler to be safe 🙂 I hope your cake turns out amazing!! My 6 year old loves watching your videos! He asked me to make this cake for his birthday party and he LOVED it! ? Hi! Thanks for posting so much information and your recipes. I don’t understand what the tbsp o f egg white adds to the frosting especially since it’s such as small amount? Can you tell me what it does? of course! It really just adds to the texture of the frosting! It makes it super smooth and tiny bit fluffier! You’d be surprised, but that little bit really lightens it up! !